So, I couldn’t sleep the other night and woke up at 3am really thirsty. Heading out to the kitchen to get a glass of water, I noticed something odd in the backyard. 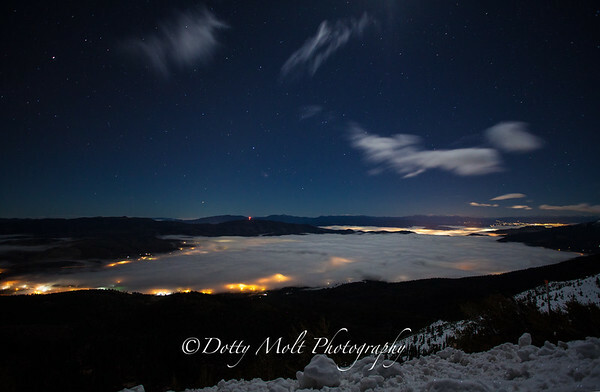 There was a quarter moon shining down on a huge cloud bank covering most of Washoe Valley! Needless to say, and being an adventurer at heart, I threw on some clothes, and jumped in the Jeep, heading up to shoot down on this enormous cloudbank. We see lenticulars all the time in the Valley, and I’ve shot my fair share of those, but cloud banks don’t happen all the time. As I drove up, I kept my speed down, we’d had a ton of rain in the past 48 hours, and the roads were covered with black ice. As I came up to the base of the Winters Creek Lodge, I parked right by the guard rail, and stepped out cautiously, treading lightly on the slick surface under my feet. I had rushed out of the house so quickly that I forgot my ski jacket, and with the temperature down to 35 degres, it was a little chilly. Needless to say I took two 1 minute exposures, checked to make sure they were in focus, and jumped back in the car with the heat blasting. I then drove over to Lake Tahoe, hoping for a bank of clouds over the Lake, but I was out of luck this time. So, I turned around to come back home, stopping twice to shoot the stars overhead. I was back in bed by 5am, and back up at 7am, ready for my run and to start the day. Officially start it anyhow. Photographing iconic locations has become a national past time. Almost everyone has a camera, or an IPhone, or a camera on their phone, and therefore, everyone is a photographer ! If you’re planning to shoot an iconic location, i.e. Tunnel View at Yosemite, The Watchman from the bridge in Zion, the Mono Lake Tufas, and you arrive right at sunrise or sunset, you might not be able to find a vantage point you like due to the crowds of people waiting for the sunrise or sunset, and if you do, you’ll end up with the same photograph as thousands of other photographers. So, how do you find iconic shots that are unique and beautiful, that you won’t see plastered all over the web? You take extreme measures and go off the beaten path! You need to be a fearless explorer with a huge sense of adventure, and the right equipment for where you’re headed to shoot. 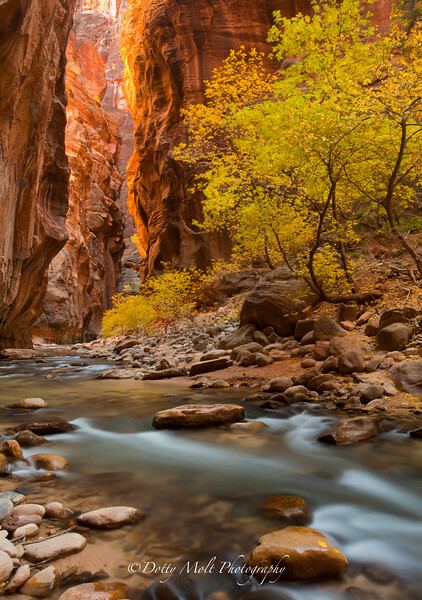 Last month I flew to Las Vegas and drove to Zion to attend a photography workshop with the Aperture Academy. 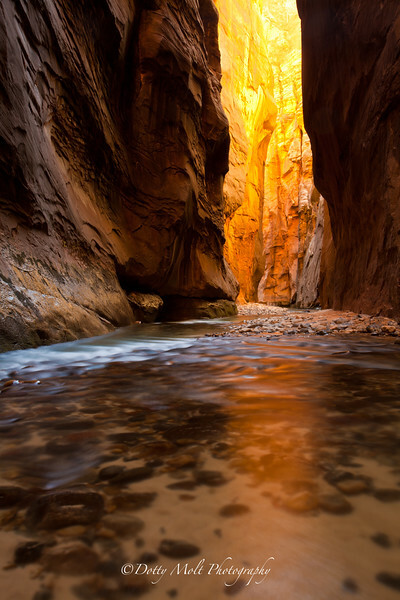 I didn’t relish the idea of shooting with a group, but this was an Extreme workshop, hiking in the Virgin River in the Narrows, in a dry suit, with a twenty pound backpack filled with photography gear on my back, and something I wouldn’t consider doing on my own. At least not the first time. We were lucky in that the flow of the river was only about 42 cubic feet per second, and the deepest point was only about 4 feet. We were also lucky that it was a sunny day because without the light shining down into the Narrows, the opportunity for photographing gold and red reflected hues from the walls onto the river would not have existed. We began our trek in the River at dawn, stopped a few times along the way, setting up tripods and shooting low and fast, capturing flowing water, and finally, as the sun crested high enough over the top of the canyon, golden reflections! We happened along a few professional photographers along the way, but the people shooting with I Phones didn’t start to appear until a little too late for the best light. I’m guessing that most of the latecomers captured beautiful shots of the river, but I’m also guessing that their photos didn’t look like ours. Author Dotty MoltPosted on December 2, 2012 Leave a comment on Hello world!